Boy do I have the most gorgeous watch to show you all today. I genuinely cannot stop looking at it. I recently got the opportunity to collaborate with Adexe London and I quite honestly jumped at the chance. A pretty watch is something that’s been on my wishlist for the longest time and now I have one, I cannot imagine it not sitting on my wrist. Adexe London offer a supreme collection of watches ranging widely in price so they are brilliant for treating yourself or a loved one. A possible graduation or birthday present this Summer? Or maybe something to think about as Christmas isn’t actually that far away. Scarily enough, it’ll be here before you know it! Picking just one of their many incredible watches to style was difficult but this one just jumped out at me. My go to colour for jewellery and accessories alike since I was a young teenager has been silver. My jewellery box is quite literally overflowing with different shades of it and the occasional black item. It’s only been over the past year that I seem to have succumbed to the rose-gold hype. 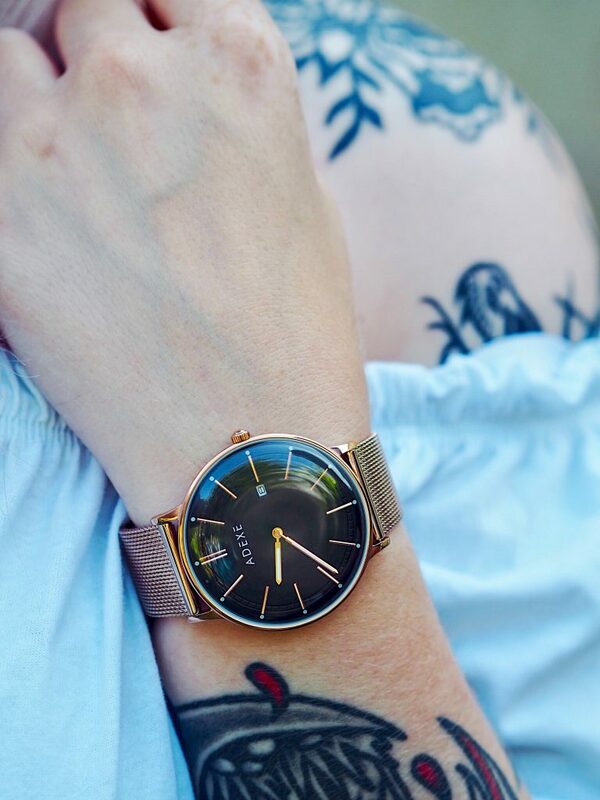 The Meek Grande Rose Gold is unisex and the watch face is 40.5mm in diameter. 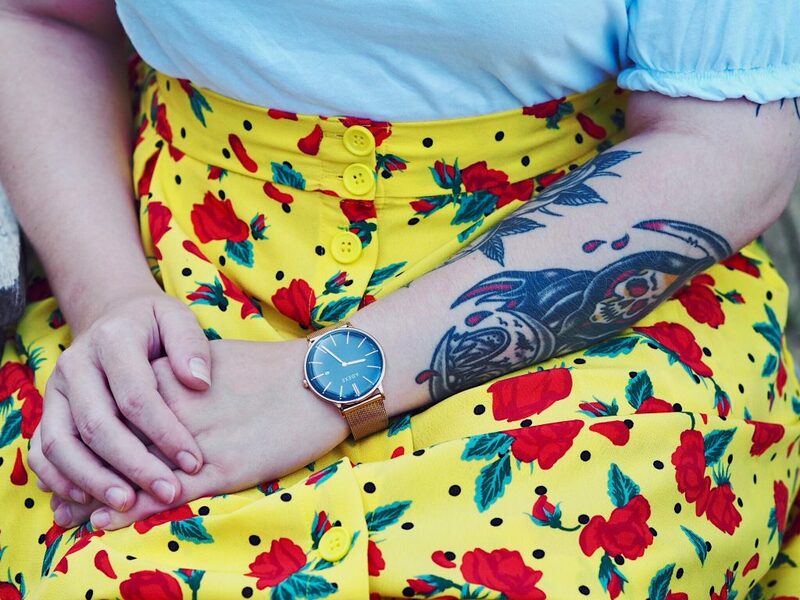 I personally have quite tiny wrists yet it sits really nicely on them and compliments my tattoos really well if I do say so myself. Its presentation on arrival radiated quality with its sleek branded box and small envelope containing my personal warranty and handwritten model number. The case and strap material is hand-polished stainless steel and the glass, curved hardened crystal. Because of this, the sheer beauty of the design and the fact that each watch is hand-crafted, I think it fully deserves its £109 price tag. It also has a 5 year battery life and its water resistance is 3 ATM. This means you won’t have to worry about every day contact with water but you will need to remove it whilst showering/bathing. Black is my favourite colour to wear, decorate with and well, buy everything in, shocker. 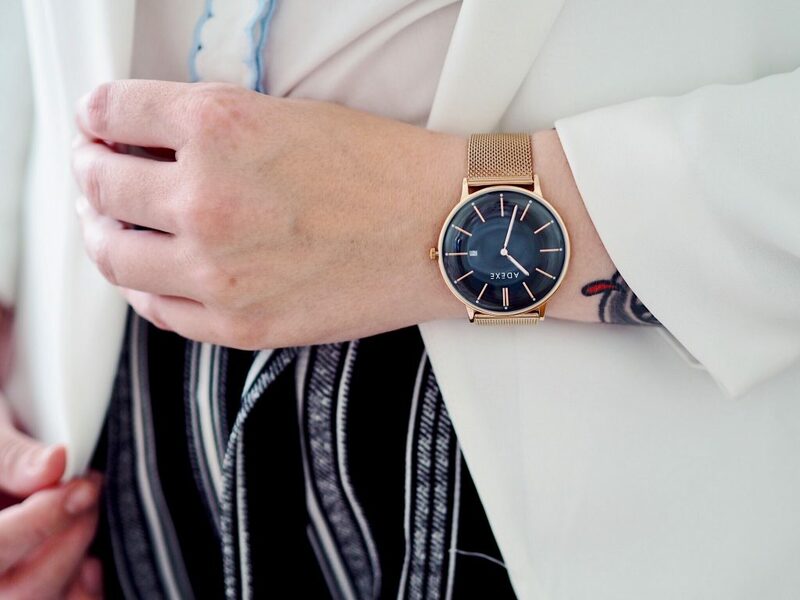 Therefore the combination of black and rose-gold on this watch was nothing short of perfect for my current style. I thought the black watch face was also such a fabulous alternative to the usual white and bright faces and offered a gorgeous contrast between the colours. When seeing this watch in the flesh for the first time, my initial thought was how incredibly professional but pretty it looked. 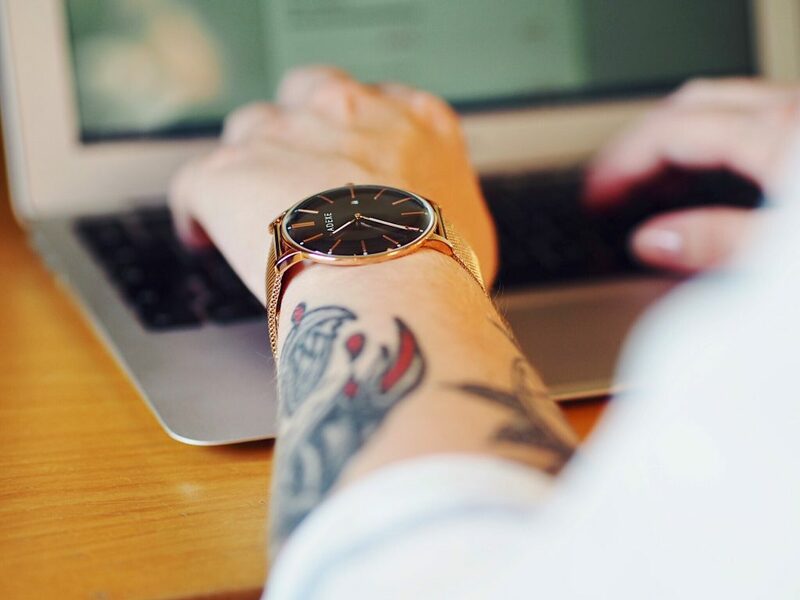 Just as easy to dress up as to dress down so todays post will be a little fashion shoot showcasing how easy styling the watch from the desk to dinner is. I imagine the majority of people have to wear mostly monochrome outfits or uniforms in their day job. I’ve gone for a typical office vibe with this styling. I like to think if I worked in an office I’d still wear funky trousers if allowed. As you can see from the pictures, the colour of this watch is beautifully accentuated and stands out against the black and white colours. In an office environment, you’re expected to wear minimal jewellery too to stay professional. This watch exerts class, simplistic elegance and is a little bit flash without being too in your face. Who doesn’t love getting glammed up for date night? It’s not often that I get to do it anymore so having an accessory as gorgeous as this on my arm other than my boyfriend makes it even more special. In all honesty, I’d usually go for a much darker number to wear for a date night. As it is Summer and yellow is all the range right now, I decided to wear this super cute long skirt matched with a little white off the shoulder top. Despite there being all sorts of colours going on, the watch still sits perfectly in the mix. It adds a beautiful extra touch of femininity. Adexe have all sorts of colours, styles, sizes and finishes to suit all tastes. Check out their site here for some tempting and timeless pieces. You can also get yourself 15% off until the 12th August 2018 with the code BLACKTULIP15. What’s your favourite colour to wear for accessories? This watch is stunning!? 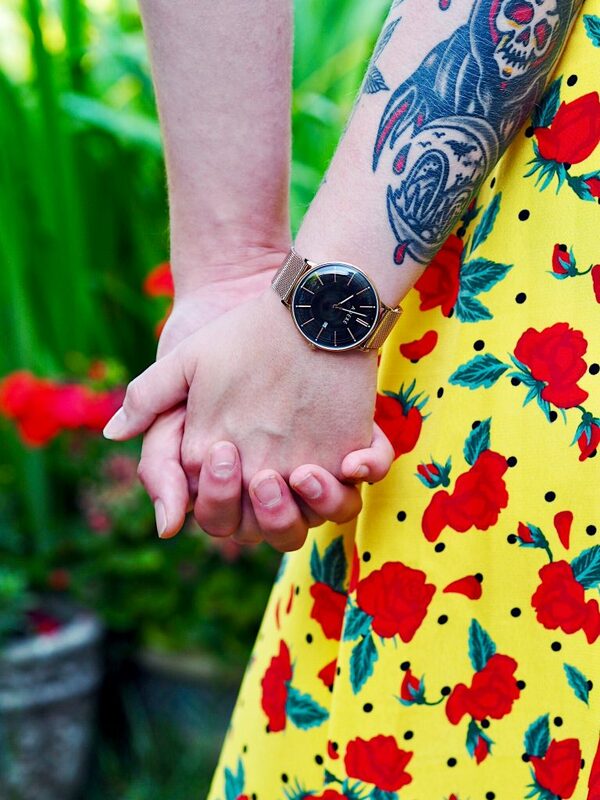 It looks amazing with both of your outfits, I’m so glad you included different outfits as it’s something I always consider when buying a watch if it will match the majority of my clothes. The watch is truly stunning! I don’t wear watches, but I really think there is something classy about owning a decent watch! Great post, love the photos! What a lovely watch! I’m obsessed with anything and everything rose gold! I love how versatile it is. It goes well with every outfit. I love your date night look! The colours of the skirt are really pretty! Great post! This watch is gorgeous! Wow I am a massive sucker for anything Rose Gold as well. I love how it matches with most things. Definitely worth the price tag for that quality! The watch is absolutely gorgeous, I love it! It would definitely go with a variety of outfits. Your photography is fantastic, you’re very talented. Such a gorgeous watch! Loving the rose gold! The black face is quite different but so elegant! your photography is amazing! I have to admit I am very much cursed when it come to watches. Everyone I’ve owned dies on me within weeks. That being said, I LOVE TO WEAR THEM!!! There’s just this level of sophistication when wearing a beautiful, high end watch I get from one. I wear them for more of a fashion statement really, because it ties together a whole outfit! Your watch is unbelievably beautiful Alice! It goes with every outfit you showed us. So gorgeous! Oooh I got sent one of these too and absolutely love it! My strap is similar to yours too, I love how you’ve styled it in different ways here, their watches are so versatile aren’t they! 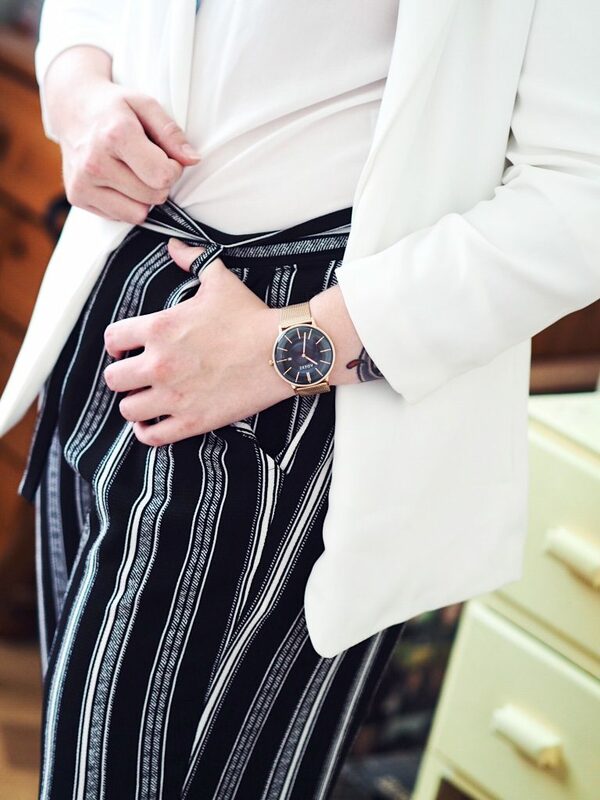 Great post lovely and I loveee those black and white striped trousers! I don’t normally like watches they have just never appealed to me but this one is just geourgous! I’ve seen these watches floating around before and I’ve always been so intrigued! I absolutely love this one and how you’ve styled it with the different outfits is so good and that skirt is so cute! Absolutely gorgeous watch! Rose gold and coppery tones are just ughhhhh <3 also lovely outfits that you've paired it with. Great post! Wow, what a gorgeous watch! I love the rose gold mesh band and the slightly domed glass face. 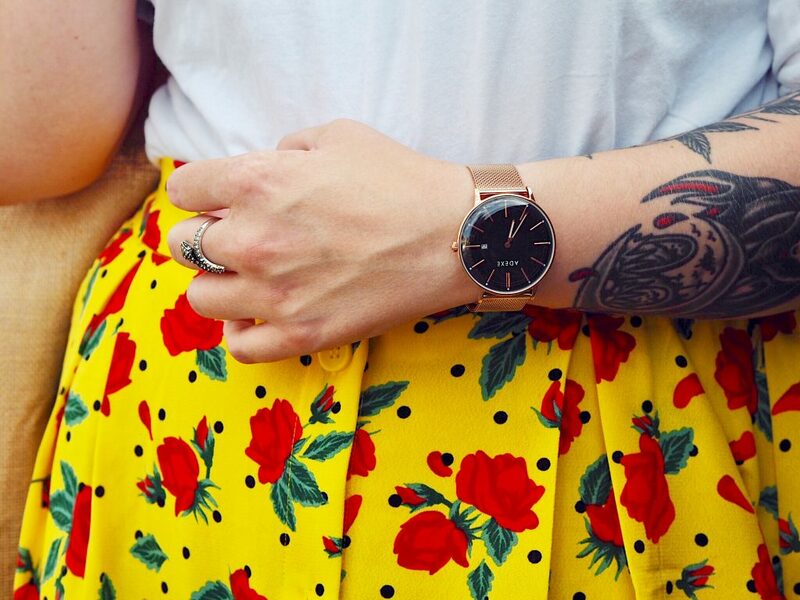 The black with the rose gold gives it an elegant look that would make it super easy to pair with just about anything. 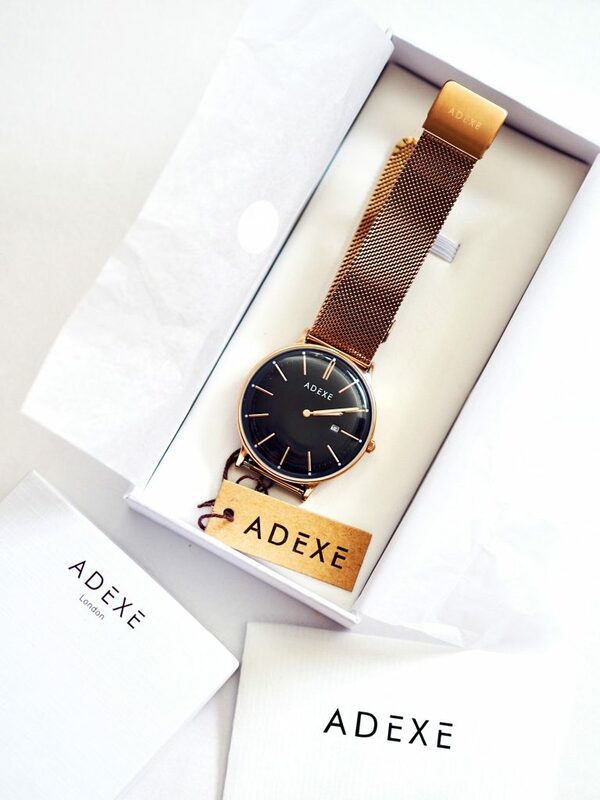 Count me a new fan of Adexe London! This watch is gorgeous! I can’t get over how well the rose gold and black compliment each other! ? This watch is stunning ? it’s my birthday next month so I’m 100% showing this to my boyfriend! I literally only wear my Fitbit now as my other watch has no battery so this would be beaut. I love how you have used the watch in this post idea – it’s amazing! This watch looks so sophisticated and sleek, Love the way this looks. 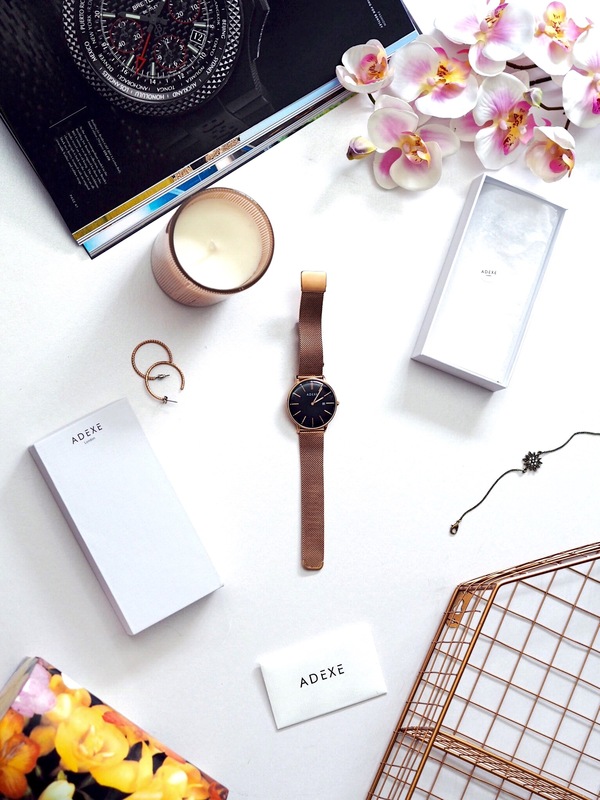 I really like how simple and classy the Adexe London watch looks! It’s a big plus that it has some water resistance – it’s good that you don’t need to worry about having to take it off when you wash your hands. I like that the watch can be paired with so many different occasions! I’m not usually a huge watch wearer, but I love the simplicity of this watch. Your photographs are so beautiful (as always) and I love your ‘date night’ outfit. 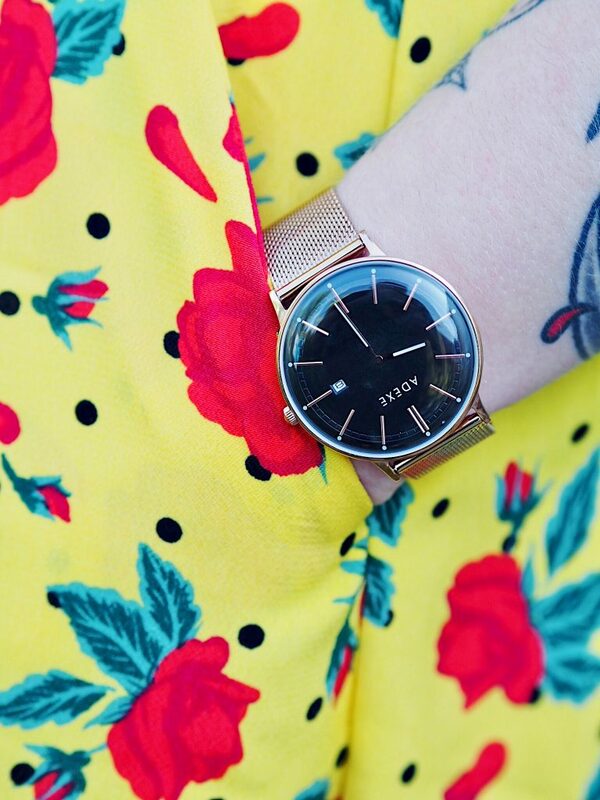 The yellow looks so lovely in summer, especially when it’s covered in flowers! Great post Alice. I love a classic watch. Your photos are so dreamy!